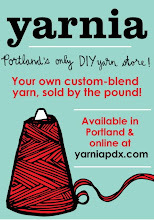 As I continue to sift through the highlights of the past six years of Yarnia’s life, this one-year-happy-birthday post stands out as a notable landmark. And, photos from our One Year Anniversary Party! Does anybody else remember being there? Does anyone remember way back in the spring of 2008, when a music video was filmed at Yarnia? No? Anyone? Well, in that case, you should take a peek at Episode 10 of The Penny Jam.